Great news! Jet Brains, the magicians behind Resharper and Team City, are out on a quest to save us from misery show us the light. dotPeek is their brand new .NET decompiler, still in early build, but live and kicking. I sincerely mourned the Reflector’s untimely “departure” and the timing couldn’t be better! The new tool is free-of-charge, which is against any commercial sense, according to the Red Gate. And I am pretty sure that Jet Brains will figure out some smart licensing, as they did with the awesome Team City (even if it won’t be free in the future, I’d rather pay for dotPeek, than Reflector). 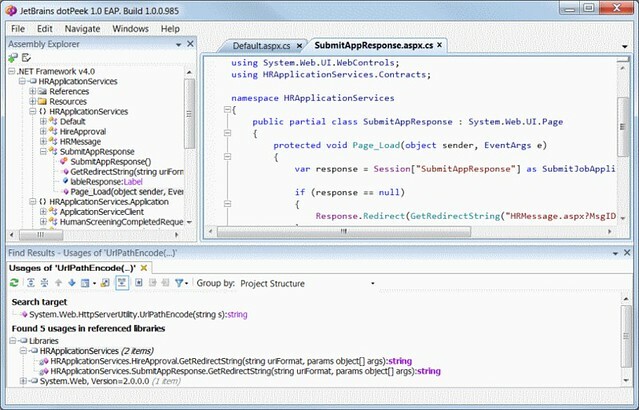 The interface is pretty slick and should look familiar to Resharper users – it even has the same Usage windows! Tabs in the code window is definitely a welcomed addition. There are tons of other features which I didn’t have time to explore yet. The only thing I am missing so far is the Reflector-style navigation using type names as links. There are few bugs, but remembering Resharper early days I am perfectly OK with it – Jet Brains proved that they can quickly react on user’s feedback. Application size is noticeably bigger, than Reflector but it will be probably eventually optimized down. Undeniably the best part in this news – we have a choice again. Telerik has jumped on this bandwagon as well. So here, here! We definitely have a choice again.